A demonstration performance of synchronized swimming "May Cause of Mt. Paektu Shine" was given at the swimming pool of the Changgwang Health Complex on Saturday on the occasion of the birth anniversary of leader Kim Jong Il (Day of the Shining Star). Among the spectators were Kim Ki Nam, secretary of the Central Committee of the Workers' Party of Korea (WPK), officials of the party organs, working people's organizations and ministries, working people in Pyongyang, overseas Koreans delegations, overseas Koreans and the chief of the Pyongyang mission of the Anti-Imperialist National Democratic Front. Present there on invitation were foreign diplomatic envoys and representatives of missions of international organizations here and their wives and foreign guests. 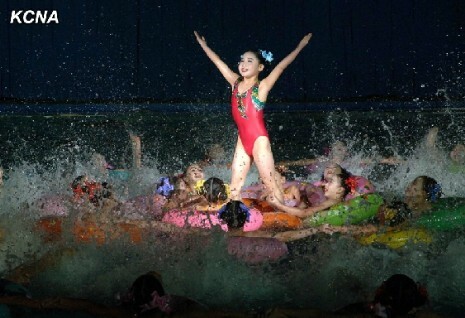 The performers presented such colorful numbers of synchronized swimming as "Thinking of General," "The General Is the Son of the Guerrillas" and "Song of Love for People". The performers represented with graceful rhythms and a variety of formation change the profound reverence for Kim Jong Il, who made ceaseless forced march of patriotic devotion with his iron will and superhuman energy till the last moments of his life. 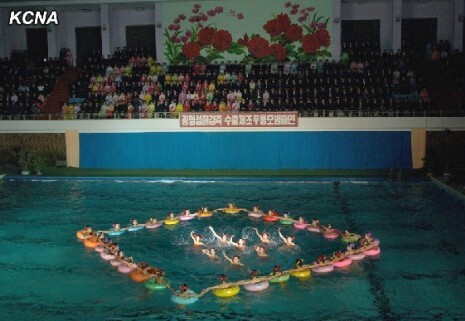 In "Party's Flag, Always with You," "Our Tender-hearted Sun" and other numbers of synchronized swimming the performers represented the happiness and pride of the Korean people holding in high esteem the peerlessly great men of Mt. Paektu and high revolutionary enthusiasm of all the service personnel and people advancing towards the rosy future of Kim Il Sung's and Kim Jong Il's Korea under the leadership of the Workers' Party of Korea. It demonstrated the faith and will of the army and people of the DPRK to unite close around Marshal Kim Jong Un and hasten a final victory in the drive for a thriving socialist nation.